JOHN CARPENTER FIRST came to Hawaii more than 40 years ago. He was 19 years old and on vacation. Like so many people who visit this tropical paradise, he fell in love with the culture, climate and laidback lifestyle and decided it would be his new home. “I came to Hawaii in the early ’70s, soon met [and eventually married] a local girl and just never found a reason to leave,” he laughs. “I was on an adventure and thought anything was possible.” And that’s pretty much how Carpenter’s life and footwear career has unfolded. It’s an entrepreneurial journey filled with chance, determination, home runs, leaps of faith, good fortune, brand extensions, talent, acquired skills, obstacles… You name it. Carpenter’s career reads like a classic three-act play complete with drama, intrigue, humor and the strong likelihood of many future acts in the years to come. But let’s start at the beginning. The Motonagas called Carpenter with an offer. Years earlier he had mentioned casually that he hoped they would give him a call when they retired. They remembered. In 1985, “their attorney said, ‘John, you’re the luckiest guy I know,’” Carpenter recalls. 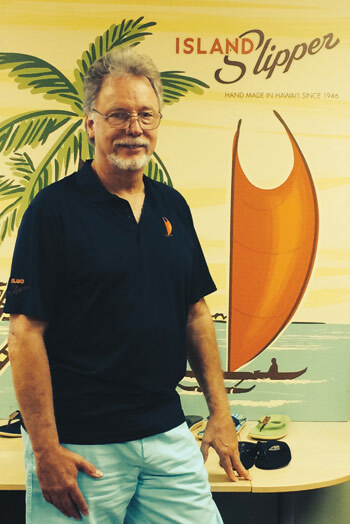 His entrepreneurial dream had come true and it was Island Slipper, the second largest (behind Scott Hawaii) of the area’s seven sandal companies at the time. Act II: It opens with the Island Slipper acquisition, where Carpenter goes on to survive numerous challenges in order to, at first, keep the business afloat and, later, to evolve into what is now a thriving, multi-faceted company spanning domestic wholesale production and a burgeoning retail division. (Island Slipper’s sales have been growing at a healthy clip of 20 to 30 percent a year over the past five years.) This was the period where Carpenter also experienced his first home run as well as some good fortune. The home run came from Carpenter’s decision to expand the men’s collection with an updated construction designed to offer all-day comfort. It featured a one-piece molded rubber outsole with arch support, heel cup and outsole contour. The construction was quite revolutionary compared to the traditional EVA sandal bottoms that wore unevenly and caused feet to slip and slide, and the addition of a neoprene or EVA insole kept the foot aligned and created a custom fit over time. A bonus: it was less expensive to manufacture. “That product just took off. We entered the men’s slipper business with a bang,” Carpenter says. “If you are the first one to market, you can have a great run, and we sure did.” The new construction doubled the company’s sales. “That’s when we turned the corner to being profitable,” he adds. It was during this run that Carpenter made some of his biggest mistakes, like shifting a portion of production offshore beginning in 2000. But that mistake led to his about-face epiphany: becoming a smaller, domestic-based maker of quality sandals that trades primarily on its rich Hawaiian heritage. While brands like Teva blew past Island Slipper, Carpenter decided that wasn’t his style of doing business. He believed bigger isn’t always better, and he preferred to run the business without outside investors or partners. Act III: Much of this current period involves Carpenter’s commitment to one day passing the reins over to his son and daughter-in-law and, perhaps, even to their son. It’s an exit strategy that’s still in the distance, but Carpenter believes it’s the best way to show the enormous gratitude he has to everyone who works at Island Slipper. To Carpenter, Island Slipper is like one big extended Hawaiian family that he aims to keep together as long as possible. Does it seem like Island Slipper has entered another phase since your son and his wife joined? Yes, the business has taken on a new life. It presents a whole new dynamic, and there’s also a certain amount of pride involved when your children take interest in what you do. But, the challenge is to make that generational transition without messing up. First, you need to trust them and they must be capable. Fortunately, my son and daughter-in-law bring business management and technology skills, respectively. The change going forward is for them to take on the basic day-to-day business responsibilities that will allow me to focus more on the creative aspects. Eventually, there will come a time where I will take them under my wing and work with them in these areas. It’s all about what’s best for the brand and the future of our company. That’s why I always try to include anybody in the process that I can. It can be our store manager, someone who works in our office, one of our factory supervisors, whomever. We even open it up to customers. You’d be surprised about what you can learn through such an open ideas process. Particularly with smaller-sized businesses, succession plans can be difficult and even result in their demise. I agree. That’s why we have built in very strong tenets as to who we are, why we do business the way we do and what our brand represents. My family knows that history well so they hopefully won’t make some of the mistakes that I did. Also, I have one child, so in some ways it makes this transitioning process pretty simple. And let me add that he made a great choice in marriage. She is a brilliant woman. It’s been fun to have them come aboard. What do you attribute the company’s recent run of success to most? Are there any particular reasons as to why the stores have performed so well? First off, as one of the last remaining manufacturers of slippers in Hawaii—an iconic aspect of our culture—it makes our stores truly unique and a destination. People who travel to Hawaii love to experience authentic aspects of the culture. Our product and our brand story fulfill that desire. The locals appreciate it as well. It’s part of the whole ‘shop local’ movement. Another reason has to do with our expanded product offering. We have styles that are suitable in traditional resort shops as well as fashion boutiques in places like New York and Tokyo. It has enabled us to fill an entire store with just our brand and appeal to a wide range of customers, spanning men and women, young and old. Most factory brands are not able to do that. It requires craftsmen who possess many skills with regards to fit, last construction and cutting. Our employees sometimes are working on 20 different styles in a single day. While it makes our jobs difficult, it’s also another point of uniqueness for Island Slipper. Also, the stores serve as incubators for testing new products that feature unique fabrics. On occasion, these styles have sold well, which we then add into the collection for wholesale distribution. The ability to come up with an idea, make it, test it in our store and watch the reaction has been invaluable for us. Might you open concept stores beyond Hawaii? Personally, I don’t see it as one of my endeavors. But for the next generation, it’s an option for growth. In the meantime, it’s unique to Hawaii and we can do plenty of business here. More importantly, I will not change the wholesale distribution focus of our company because, to me, that’s part of being, quote unquote, a real brand. Also, the stores increase the demands on our factory, which presents challenges. It’s not like we would outsource product. We have to make it here. You aren’t in danger of maxing out production capacity any time soon, even at 20 percent-plus annual growth of late? We have room to keep expanding production here for the foreseeable future. Regardless, I’ve already learned the mistake of moving production offshore and making Island Slipper and private label goods for the likes of Macy’s, Costco and West Marine. That led to one of the real turning points for me in our history. It was spurred by a random call I received from a customer in Florida. This fisherman told me how he’d worn our product for years and always loved it but his most recent pair (made in China) wasn’t of the same quality. It made me change our entire business model. I decided I didn’t want us to be an offshore contractor primarily servicing large retailers and the production issues that come along with that approach. While it made our lives very difficult at the onset, we made a conscious effort to pull that part of the business off the table. How exactly did that impact your sales? It was a huge loss at first. It was a gutsy, gutsy move. But I have seen time again how the same product from a brand one year to the next year can change dramatically for the worse. I didn’t want that to be the case for Island Slipper. Everyone says you can’t stay in business unless you shift production overseas, and pretty much everybody has done exactly that. But what would be the effect if the auto industry decided to follow suit? How is it we can still make cars, but we can’t make shoes in this country? It’s ridiculous. Well, public companies claim to have valid reasons. Of course, companies grow, they go public, they get investors that demand better returns, production demands and logistics change dramatically, etc. I made a conscious decision not to go down that road. If I did, what would have been the difference between Island Slipper and Reef, Scott, Teva and everyone else manufacturing in China? There would be absolutely no difference. We’d be just another brand name. Plus, we would be up against much bigger companies that would have probably required us to take on investors in order to remain competitive. Instead, we went the opposite route and tied Island Slipper to its rich heritage as a domestic-based maker of quality products. It was a way to market our brand as being unique. It’s one of the reasons why our stores feature pictures of our employees working in our factory. It’s an interesting aspect about our company. You can’t go into too many stores these days and see pictures of the people who actually made the products being sold there. Hawaii presents a great branding opportunity. It has tremendous recognition. It evokes a good feeling for millions of consumers. It’s also why plenty of other brands try and connect to those positives. However, few of those brands are actually headquartered in Hawaii and none of them, when it comes to footwear, manufacture here. How does that really make them Hawaiian? They may do a great marketing job, but they’re not genuine. We view those brands more like Astroturf. Consumers today increasingly seek authenticity in their purchases. Yes, especially for discerning people who don’t want to buy just stuff. Their space and budgets may be limited so they are more conscious about what they are buying. They are doing more research about a brand than the person who runs to the local store and buys whatever is on sale. That’s where Island Slipper can shine because we possess that history and make a quality product. There’s an authentic story attached. Did you foresee the “shop local” and “Made in the U.S.A.” trends coming on? Not exactly, but when I got out of importing I realized that was going to define exactly who we were going forward. I had also received a sign (literally) from a locally made swimwear brand that had a billboard in Japan stating, “Last Year Made in Hawaii.” My Japanese distributor said it would probably be the last year Japanese customers will be interested in buying that brand. Basically, if you want to kill your brand in Japan, make it in China. So it was a combination of all these things that made me realize that there’s value to this domestically produced model. And now there are entire retail concepts consisting strictly of made-in-the-U.S.A. product popping up in the mainland, too. Island Slipper is going against the grain in terms of sourcing, distribution, design, growth strategy, etc. Is it an anomaly? Well, I’m sure there are others. But I will say we are able to pick and choose how we want to do business, and that’s the way we like to do it. In the past, we’ve struggled dealing with large department stores where you work with a buyer and six months later you get an e-mail that he’s moved on to lingerie and the new footwear buyer is from men’s clothing. It says he’ll contact you, but he doesn’t. You try to follow up but you never hear from him. I don’t miss that inconsistency. The fact is that most of those types of retailers don’t take a strong interest in what your brand story is all about. They want their markdown money at the end of the season and that’s about it. They say they know our pricing but still ask, “What’s my price?” I just prefer to steer clear of all that. I’d rather gain distribution in upscale boutiques in New York. The bulk of your distribution is through independents, correct? Yes, with the exception of J. Crew. About six years ago we discovered that one of their buyers had been buying a ton of sandals off our site. So we called and asked if the interest was personal or business? He said it was business-related and that he really liked our product. He had discovered us while attending a men’s show in Italy, having come across our Japanese distributors who are very selective. He later shopped Japan and saw how Island Slipper is often featured in their leading fashion magazines and sold in trendy stores. He also said he liked the fact that we were made in Hawaii. I was upfront and said we’re not interested in being a contractor for J. Crew, but I would be willing to make exclusive product for them. Our first collaboration featured a slipper collection made out of denim that did very well. Another season, they shipped us recycled army tents and we made another successful collection. It’s been a fun and very creative process. It’s always something different and exclusive. While the job is very demanding at times, if you are truly a footwear person—if it’s in your blood—and you really like to make stuff and be hands-on and control your own destiny, then you would love my job. For me, this is a perfect fit. Lastly, just to clarify, is the correct term slipper, flip-flop, sandal, thong or, as Hawaiians pronounce it, slippah? I’ll answer it by saying the store that we converted into our first Island Slipper location was named Thongs & Things. Before we transitioned the name to Island Slipper, we would get some of the most unusual phone calls from people asking about the different types of thongs that might be for sale. Only they weren’t referring to footwear. It got a little weird at times. So thongs is incorrect. Here, the term is slipper, and dropping the “r” is an affectionate reference. And calling them flip-flops in Hawaii is just wrong. Flip-flops is an F word? Well, I wouldn’t go that far. But why would you ever want to wear something that a politician does? Whenever I have the time, I like to read novels by David Baldacci. Usually, between trade shows, our family will visit one of the outer islands of Hawaii. After FN Platform, we are heading to New York to meet with some suppliers and we’ll mix in some vacation there as well. My (first) grandson and what that entails for his future and the future of our company. I already have a son and daughter-in-law working in the business, but my grandson is my inspiration to make sure that the company is there for him if he so chooses. Like who you work with and love what you do. My wife. I’m not one to invite a stranger to dinner. To be honest, I have a great group of employees and I don’t have anyone in mind right now. Trade winds blowing through the palm trees. It’s natural here, and one of those soothing sounds you might use to fall asleep to at night. Riding horseback in Waterford, CA, with my dad on our family’s ranch. It was one of the simple things to do there, and I have very fond memories of it.